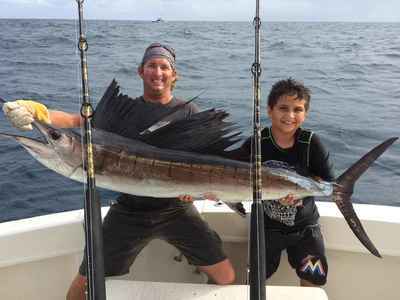 Fishing charters in Ft. Lauderdale continue to offer good catches. The continuing on shore winds have pushed some Dorado (Mahi-Mahi /Dolphin) up inside and close to shore. Sailfish which almost always like a good breeze are working the bait along the outside reef and giving us opportunities both trolling and on live baits. And the Kingfish have remained in our area and are in the box every day. Still a good number of pint sized Cudas interrupting the program. With the good results from trolling and live baiting we have not tried the Snapper out deeper, but have had some Grouper action on the bottom rod while kite fishing the surface. We continue to do the majority of our fishing within 2 miles of shore. This has been a poor moon for Wahoo for us but good catches of other types of fish have been available as we spoke. We have day and night Swordfish on the books and are looking forward to that. Here comes the next front and these winds will swing around quickly if the forecast is accurate. As for now we have the onshore breeze and it still has some punch but is winding down.